Pacers in Europe are between success and anonymity! I'm the only owner of a Pacer there actually. Somehow proud, but lonely! I have to restore it, and it will be done by... 2004! 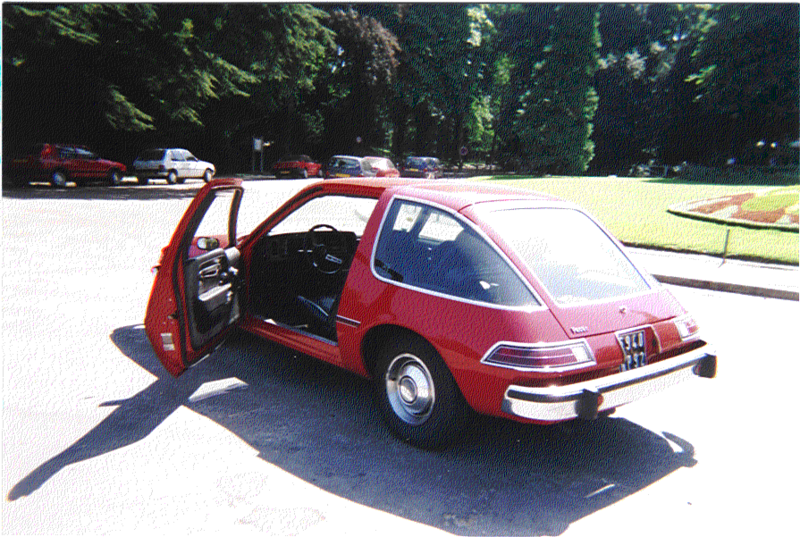 FRANCE: THE Success story of the Pacer! About 2000 came here over, mainly for the show or business people! Here a sample of the advertisement that made the Pacer such nice butted... car! 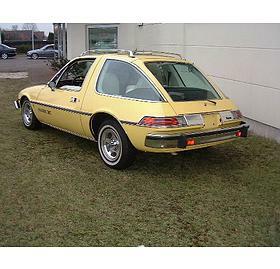 Here another French Pacer, long owned by Christophe Salvaing! François Clerget drives since 15 years a Pacer 1976 very good condition, now (1999) by it's original 120.000 kms. In France, many Pacers have been loosing their big US engine for a Peugeot -Indenor Diesel engine, helping to have a good MPG (25 mpg) about double of the regular US-ones! But those cars weren't to much good in performances of course. Those where transformed in Soissons for the exclusive dealer Jean Charles Automobiles. Having much more power the the Diesel engines for about the same consumption. 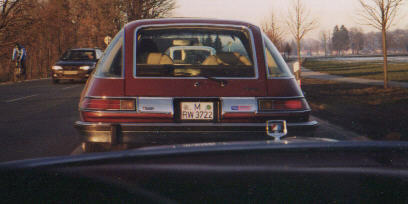 The 3 Pacer in the back are German ones. They were brought together for the TV Magazine Motorshow of the VOX-TV! You can download it here as a mpg or here as an avi file (quit big for slow connections). He took also my brown Pacer which was for free to rebuild one out of them! Go to Wolfgang's Pacer website to know more about Pacers in Germany! Switzerland: in 1996, 54 Pacer where riding around legally. 2 years later, there where 36 left including a 4x4 that I unfortunately don't know exactly where in this small country! Go to the Swiss Gremlin and Pacer Club to know more. It got again some activity in 1998. The car is actually fully loaded (TV, heating seats...). Nederland: a few out there too, go to this site to know more! 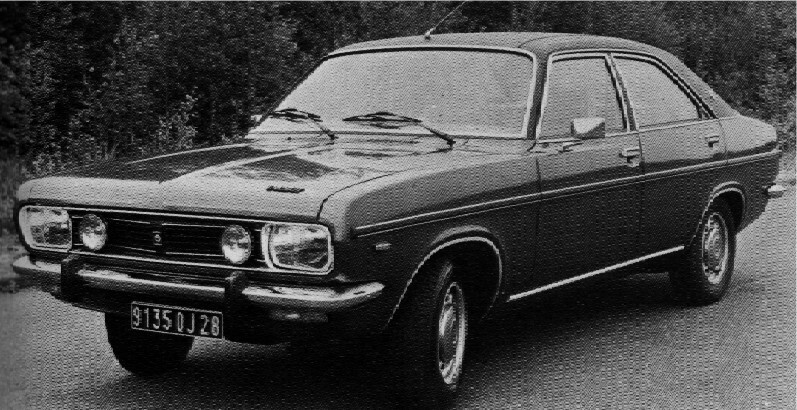 SCANDINAVIA: Pacer where really appreciate over there as they could fit into a special law by condemning the rear seat and get therefore a low taxing! It seems there is still about 200 in Denmark and in Sweden... Contact the local AMC Club! That one came from Germany and is now in Italy! Meet his owner! 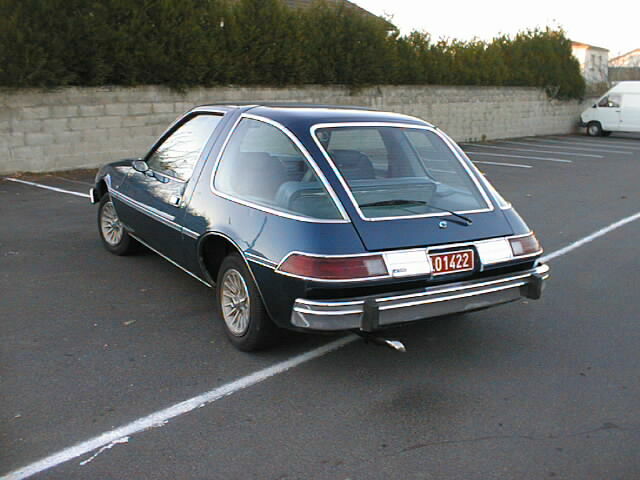 ENGLAND: A Pacer has been seen by the President of the AMC PACER and GREMLIN club a few years ago! If you got pictures or reports of European Pacer, let me know!